ON Semiconductor에서 수석연구원으로 재직중인 김진태 박사과정의 SCI(E) 저널이 Energies의 Cover에 실리게 되었습니다. As demand of electrical devices steeply increases, PFC circuits have drawn lots attraction to control harmonic pollution on the power grid. So far, the conventional PFC control methods have shown limited PFC performance, for example, increasing harmonic distortion depending on load or input voltage variation. To overcome the problem, new control methods have been proposed, which showed better performance, but are relative complicated. 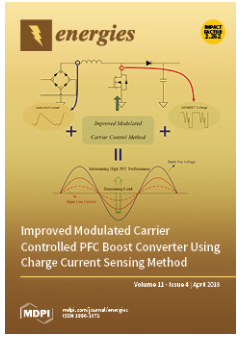 Now, new modulated carrier control method is proposed to provide high PF and low THD regardless of input voltage range and load variation. This is realized and demonstrated in this paper.